Well, the halloween eve snow store at our neck of the woods closed out the garden for us. We spent the pre-storm evening pulling peppers, lot and lots of them.We had a chockfull of green tomatoes and green beans to boot. Makes for a wonderful harvest, I was just sorry that we had to wrap up things a little earlier that most years but as they say you cannot change nature. Almost out of accident, we ended up with an almost picnic style supper. I chanced on a recipe for brined fried chicken, and ended up constructing my recipe for lime and ginger fried shrimp (brined of course) and the crunchy potato salad that I am about to share with you. It is interesting that we usually think of potato salad as a summer delight, but the farmers market is prolific with potatoes right now. I used red potatoes, leaving the skin on and pairing it with some thinly chopped blanched green beans and brown lentils. The dressing was a nice peppery yogurt and mayo dressing nicely fortified with walnut oil and white vinegar, the flavors came together exceedingly well. I think this recipe would work any time of the year but certainly brightened our impromptu picnic spread. 1. Heat the water two medium sized pots. Add the lentils and the potatoes in them in separate places. Cook the potatoes until fork tender and the lentils until soft but not mushy. The potatoes will take about 15 minutes and the lentils about 10 minutes. 2. Drain the potatoes and the lentils thoroughly. 3. In a separate pot bring some additional water to a boil. 4. While the water is boiling cut the potatoes into a coarse dice, this should be done while still hot and place into a mixing bowl. 5. Add in the lentils and toss with the salt and the black salt. 6. Add the green beans to the boiling water and cook for about 3 minutes and drain thoroughly and add to the potatoes and lentils. 7. Add in the red onions and mix well. 8. Add in the walnut oil and the white vinegar and the black pepper and mix well. 9. 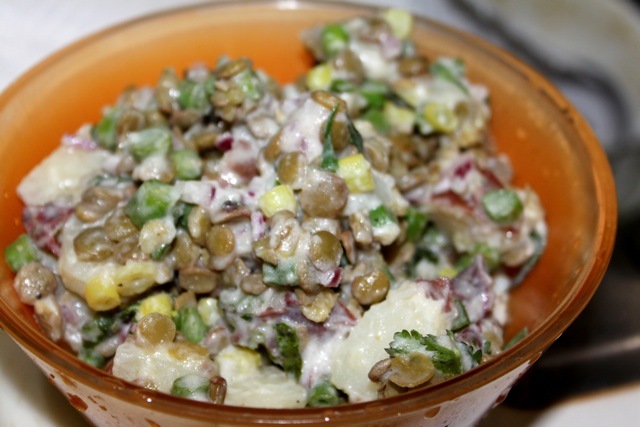 Mix the yogurt and the mayonnaise well and toss the potatoes and lentils with this mixture. 10. Stir in the cilantro and let the flavors settle for about 5 minutes and then serve.